Felixstowe straggles out into its dull suburbia, becoming Walton, and then Trimley. Before you reach the twin Trimley Anglican parish churches of St Mary and St Martin in their joint graveyard, you pass a utilitarian yellow brick structure on the same side of the road. This Catholic church has a history which is rather more interesting than its architecture. Despite the remoteness of this corner from the Bishop's house in Northampton, pastoral provision for the Ipswich/Woodbridge/Felixstowe triangle had become something of a priority by the early 1960s. A mission from Northampton began to celebrate Mass regularly at the house of local woman Jose Posford, and the large number of people attending indicated a real need for a local Mass centre. Safe and 1990s sound. But what did we lose? The church would be served from St Felix, in the centre of Felixstowe, and would be one of the first churches built in England in the immediate aftermath of the Second Vatican Council, which urged the need for a new church architecture, using the language of community rather than heirarchy. It was built on land donated by Jose Posford's family. Looking startlingy like a squarer, smaller version of the new Liverpool Catholic Cathedral, the church of St Cecilia was consecrated by the Bishop of Northampton on 22nd May 1966. It was full of the spirit of its age, with wood panel facing inside and out, and an altar placed right in the centre. Left: St Cecilia, soon after opening in 1966. Very much in the spirit of the post-Vatican II age, but with a nod back to the Festival of Britain. 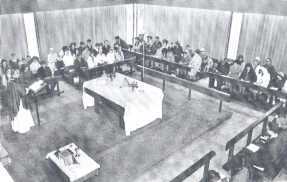 Below: Mass in the round, 1966. (both photos are borrowed from Terry Madden's book - for details, see below). The church was developed in an organic fashion. In the 1970s, it was given a statue of St Cecilia, donated by an Anglican friend of the parish, and a fine organ was acquired in the 1980s, an appropriate addition for a church dedicated to the patron Saint of music. By now, the Diocese of East Anglia had been carved out of the Northampton Diocese, and all seemed set fair for the future. And then, on the afternoon of Wednesday 3rd October 1990, the church of St Cecilia was completely destroyed by fire. A parishioner managed to rescue the missal, lectionary, tabernacle and Blessed Sacrament before the roof collapsed, but everything else was lost - there wasn't even a shell remaining, due to the large amount of wood used in the construction. 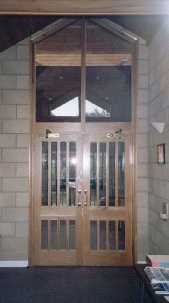 Inner door - the presence of Christ locked against the people of God? A friend of mine was Parish Priest of St Felix and St Cecilia at the time. He remembers that he was in an important meeting with the Bishop of East Anglia, when someone brought him the news. "Bishop, I must withdraw - my church is burning down" is still considered by many in the Diocese to be the best excuse ever given for getting out of a meeting. The local Anglican church of St Mary was offered to the homeless congregation as a temporary Mass centre, and the offer gratefully accepted. As before, the plans for the new church were drawn up in full consultation with the parishioners. 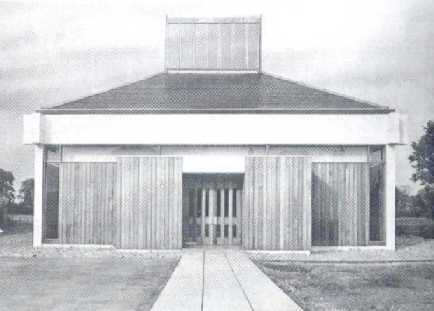 It was decided by everybody that they still wanted a church in the round, but changes were made to some of the dimensions to allow other uses not to disturb the sanctuary, and a more practical, but less interesting, material was used for the exterior. It cost £126,000, took 20 weeks to build, and was consecrated by the Bishop of East Anglia on 25th September 1992. The scorched missal and lectionary are still in use, but almost all the other fittings are new. I would very much like to show you pictures of the beautiful frontals, statues and pictures, but this church is kept locked, which is a great pity. 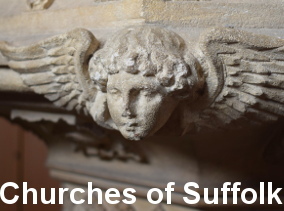 St Cecilia is still served from St Felix, but like many Mass centres as taken on a parochial life of its own - not least because it has the largest congregation of any of the Trimley churches. 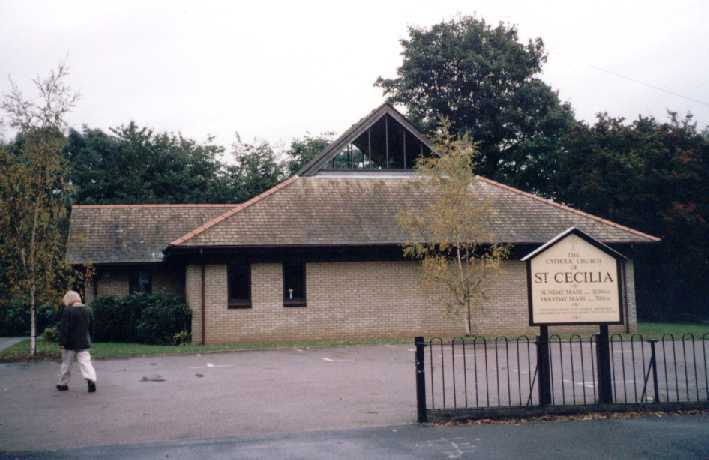 St Cecilia, Trimley, is on the main road from the centre of Felixstowe, just byond the Dock Spur Road bridge. I am afraid that it is kept locked. Once again, I am profoundly grateful to Terry Madden's superb 'St Felix parish 1899-1999' from which the black and white photographs here are borrowed. It is the best book I have ever read about a Catholic parish, and is available from St Felix presbytery, or can be ordered with the ISBN number 0 9536715 0 X.